When I arrived here in Sweden, I was warned about a number of things. To be punctual, for example (which, for me, is a total nightmare). To take off my shoes whenever I was visiting someone at their home. To be “lagom”, i.e. not to try to be better than anybody else. Last February, The Local, a Swedish news site in English, published a list of 20 things any foreigner should know before moving to Sweden, and I found myself smiling and nodding over more than one thing. 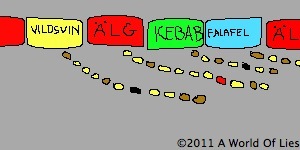 There was one phenomenon, however, I hadn’t really experienced: the Swedish art of queuing. I was told the Swedes are patient, and usually await their turn calmly, in a queue. To get on the bus, for example, they form a queue along the bus, waiting to get on. Anywhere else, however, there were only very little queues to be spotted. The reason is very simple: there are numbers everywhere. You go to the bank? You take a number. You want to buy a train ticket? You take a number. You go to the butcher’s? You take a number. You call a help line? You get a number! But last Saturday, I was finally able to witness the queuing in its glorious perfection. Picknick tables on the street at Malmöfestivalen. 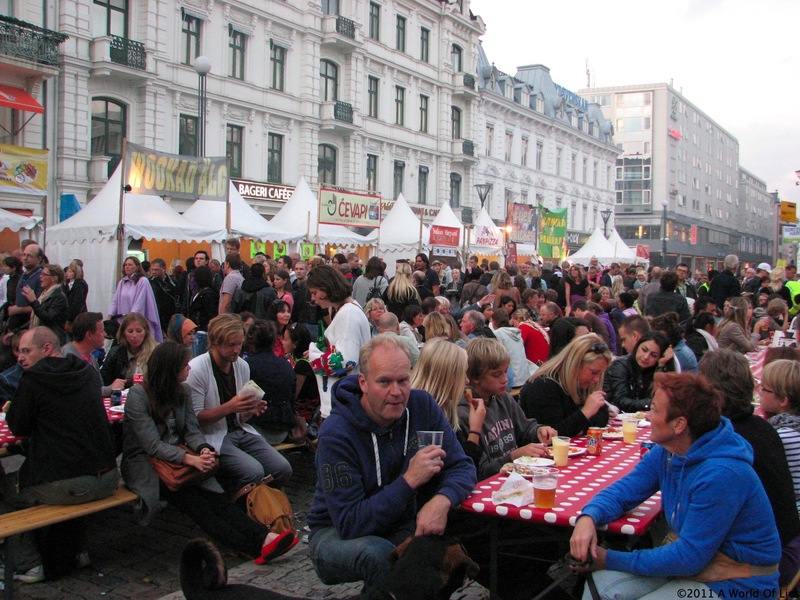 Currently, in Malmö, there is the Malmöfestivalen, a free open-air music festival. Apart from the big stages on almost every square, lining the streets are of course stalls with jewelry, clothes, and naturally – food. Now it happens, especially around dinner time, there’s a lot of people wanting to take something out at the same time. We have a similar (although obviously bigger and better) festival in my home town each summer, and it is always a challenge to get the attention of whoever is running the food stall and actually get your food. There’s a gazillion people on the street, pushing to get through, but when it comes to getting the food, they all queue. I tried to take a pretty picture of it, but it didn’t work out on camera at all, so you’ll have to do with the drawing. Believe me when I say it looked amazingly funny. Most fortunately, indeed. Because what on earth would they do if no queue were formed, right? Ah the options of a story today: how my friend and I missed the biggest Christmas market in Sweden (we searched high and low, but simply couldn’t find it), how I missed the lecture by Konstantin Novoselov, one of the receivers of the Nobel Prize in Physics this year for his work on graphene (on a regular lecture, you can make full use of the academic 15 mins – however, it doesn’t quite seem to work that way when the speaker recently won a Nobel Prize), or how I decorated my house with Swedish Christmas decorations (I will get you some photos of that later, though). But since I know how much you love hearing about foreign traditions ;) (although it seems to be celebrated in some parts of the US also), I present to you: Santa Lucia! 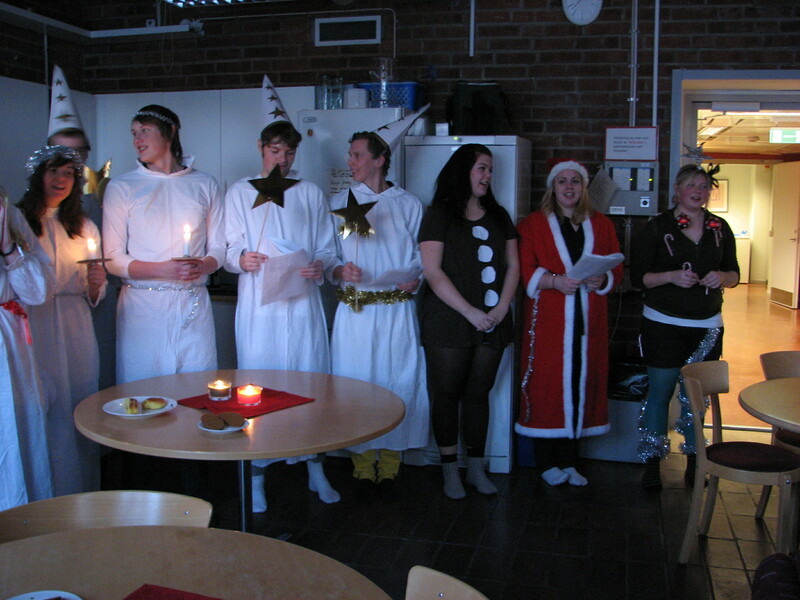 You are really supposed to be celebrating it by the crack of dawn, but I was lucky enough to be in a lab where the Lussetåg only came by around 3pm. 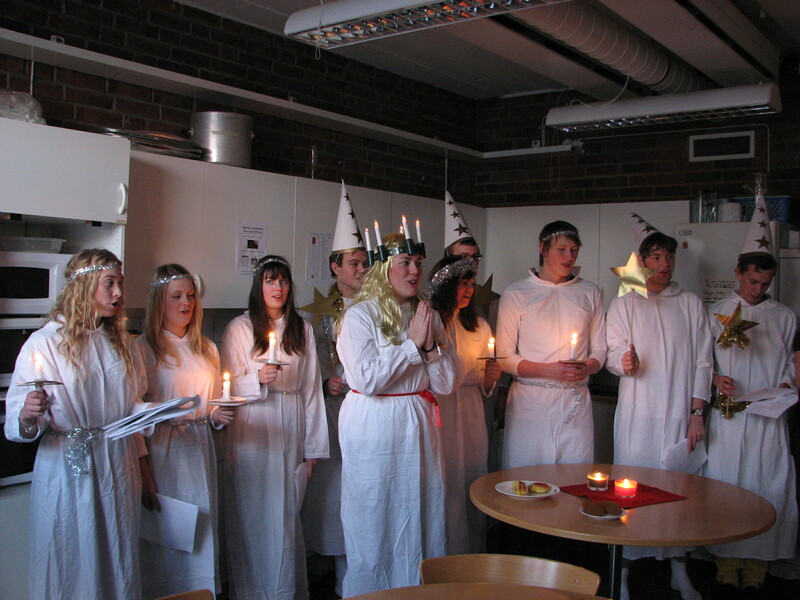 So while enjoying my lussekatt and a hot chocolate, I saw my very first Lucia procession: first comes Lucia, a girl dressed in white with long blonde hair, 5 candles (fake ones!) on her head and a red ribbon around her waist, followed by a number of other girls (virgins, supposedly…), dressed similarly but for the candles and the ribbon, and stjärngossar, and boys dressed in white with a princess-like hat and holding a star. And yes, that looks very gay. Subsequently, they sing. There appear to be a finite number of Lucia songs, but they ALL have to be sung. Which, if you don’t understand the lyrics and the singers aren’t very well trained, can be… a bit long. Don’t get me wrong, it was fun to experience and see – they were clearly very nervous and not always sure which song was the next, with the occasional girl starting to sing on her own and then – oops! – shut up :). 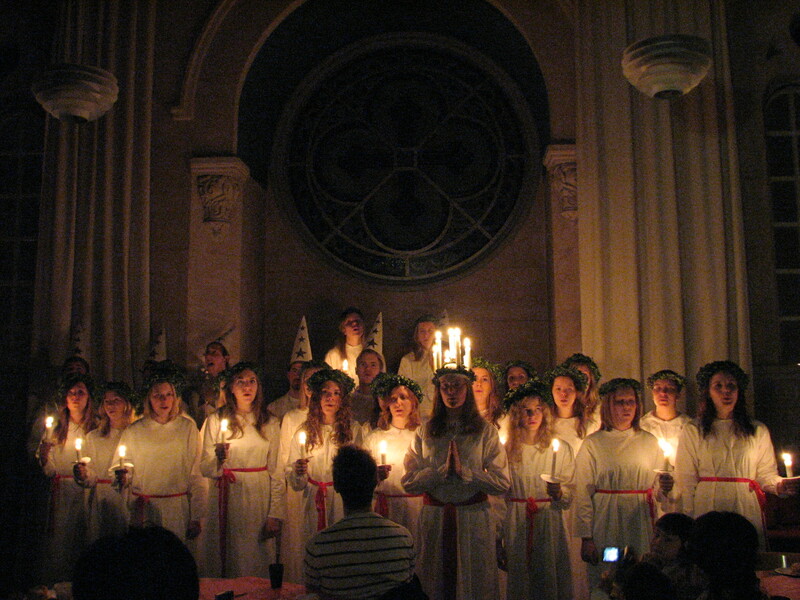 Lucia up front, with the virgins and the stjärngossar behind her. For the occasion, they also brought a gingerbread girl, Santa, and a Christmas tree. They could sing. Really. And yes, that are real candles on her head (on of the stjärngossar was carrying a bucket of water, just in case). 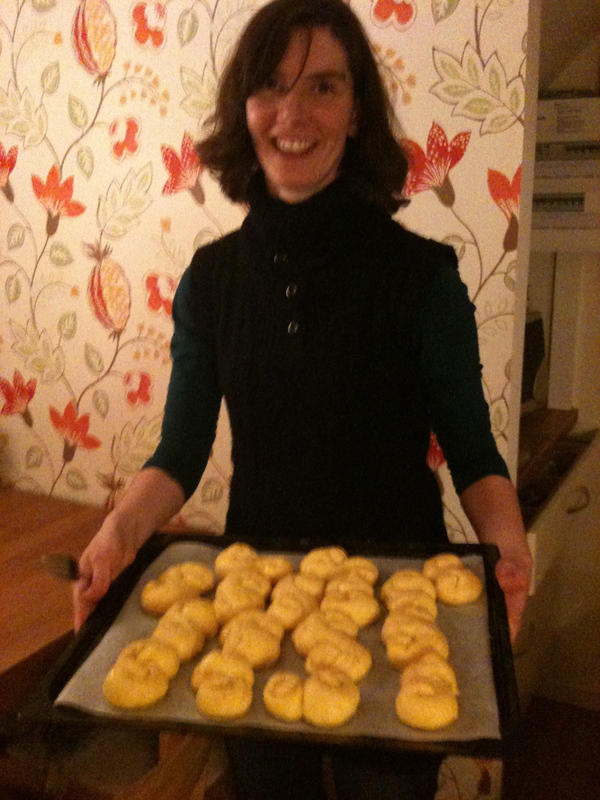 For those interested in some background history, you can read up on it below – for everyone else, I give you a picture of myself being very proud of my first home-made lussebullar (saffron buns), and the recipe! Melt butter in a small pan over low heat. Add milk and saffron and heat until about body temperature. Mix milk mixture and yeast and let sit about five minutes. Add the sugar, salt, one egg, and about half the flour. Knead the dough on a floured surface, adding flour to make a smooth dough. 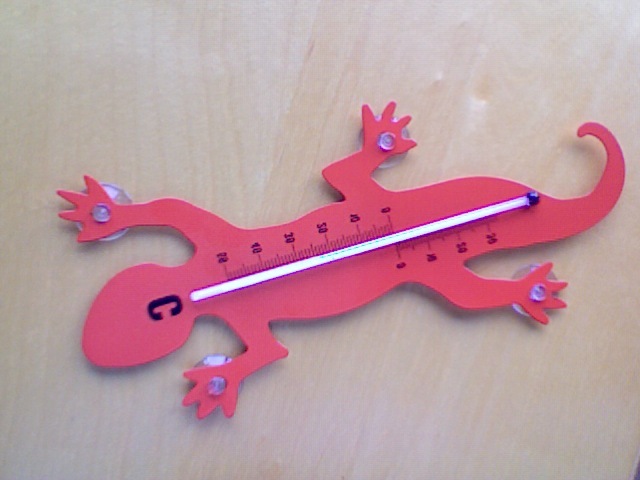 Let rise in a warm place about half an hour. Punch down, and then form into buns. Lay it on a parchment-lined baking sheet and tuck raisins into them. Let rise again in a warm place. Brush the risen buns with beaten egg. Bake at 400 degrees F about 15 min, until buns are golden brown. Lucia was a Sicilian virgin who died as a martyr in the 4th century after she was denounced to the Roman authorities as a christian by the man she refused to marry. The Romans, unable to move her, even with a 1000 man and 50 oxen pulling (try to picture this… does anybody else find it hilarious?? ), decided to burn her. Which obviously didn’t work – as it never does with saints. Wikipedia states that a soldier got annoyed by her continuous reciting of encouraging words to other christians and stabbed her in the throat to shut her up (which… didn’t work, indeed), but my colleague claims she was complimented on her beautiful eyes by one of the Roman guards, after which she took them out (as only saints can do) and offered them to him. In return for her cheekiness, she was then stabbed in the side (hence the red ribbon). If you’re wondering how the Sicilian Lucia came to be one of the few saints to be celebrated in protestant Sweden – I haven’t got a clue. It was probably a mixture of traditions, since December 13 was previously believed to be the shortest day of the year, and the most dangerous one, for Lussi, a female demon, would then ride through the night to take away naughty children (through the chimney). 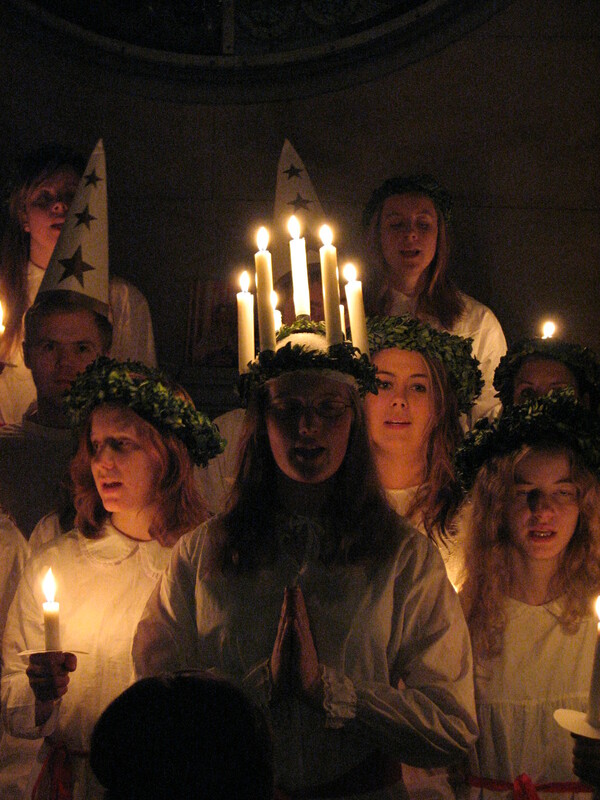 The importance of light (lux – lucia) in this time of year melted together with the day of Lucia (who is claimed to have put burning candles on her head to have both hands free while working in the catacombs). According to the same colleague though, it was just an excuse for students to party – but that in turn might derive from the custom of staying awake during Lusse-night, to make sure nothing bad happened. However it came to be – it is a must-celebrate for every Swede, and I’m happy to join in, if only because I love the lussekatten/lussebullar/saffron buns ;o). … on my own again. I will have to get used to it – a fact which was demonstrated only now when I got home and wanted to open the front door by pressing the handle instead of using the key: for the past 2 weeks, someone was waiting for me here, and the front door wasn’t locked. It was great fun and we travelled around quite alot, although I managed to arrange some drama here and there with tears on both sides – I really have to learn when to shut up. Or actually, simply to shut up. Generally I know perfectly well when I should, the problem is I don’t. Maybe I’ll come back to this later, when I’ve arranged my thoughts on the subject a little bit better. I prepared another post for today, but it’ll have to wait. See, today I tried to get inscribed for Swedish language classes. I was really looking forward, because I HATE (and yes, that needed to be in capitals) to be as isolated as I am now. Because that is exactly how it feels – isolate. While everybody (or almost everybody) here speaks English as fluently as you can expect from second language learners, it is just embarrassing having to reply “I’m sorry, could you repeat that in English?” time and time again every time someone in a shop or on the street addresses you for whichever reason. Let alone how annoying it is not being able to understand the signs in the street/in the shops, to have to ask your colleagues every single thing because you can’t even Google where the nearest hairdresser is. But I digress. Now, they have a nice little course in Sweden which is free for immigrants, called Svenska För Invandrare. For Lund, their website can be found here. Notice how it is in Swedish? Because obviously, people who want to learn Swedish… understand Swedish already, right? So we send an e-mail to Pia Lindskoug, the SFI contact person, to ask for further information. At least on the Swedish page she is designated “Kontaktperson”, there is no mention of her on the English page. Maybe that’s why I haven’t received an answer to the (English) mail I sent 2 weeks ago. But hey, we’re flexible, let’s just go and visit! I am fortunate enough to inform with my colleague about the opening hours, because those apparently don’t match what is stated on the web page (not that I found them on my own – that page was in Swedish). Now, to subscribe, you need to have a personnummer (some type of ID number). For which you need a Swedish address, a Swedish job and a Swedish person as a guarantee. Well, I’m lucky enough to be able to provide all 3, but while the application only took 10 minutes, it can take 2 months before I actually get the number – it’s a busy period, see. But no personnummer – not even a provisional (official) one – no classes. Basically, you need to be Swedish. I understand the Swedish Democrats managed to get into the parliament – with this type of policies you’re making it real hard for foreigners to learn the language, a prerequisite for integration. I thought, if I can successfully write a recap of two weeks of blogging, I can surely successfully list the things I love/hate most about Sweden, two weeks into this little project of mine? However, I hate … the lack of Freddy. Freddy was the guy in my previous lab who filled pipet tip boxes, did the dishes (you cannot believe how much dirty glassware one scientist can produce in a day), did the ordering, made media, autoclaved everything – in short, did all those lousy, dreadful things a scientist has to waste his/her time on. There is no Freddy in Sweden :(. This is maybe not the best example... but at least I could afford it. I hate … their opening hours. Granted, the supermarket is open till 10pm every day, but on Saturday you will not find any shop open after 4 or even 3pm. I mean, how can you enjoy a relaxing day of shopping when you only have 5 hours? Honestly? But I hate my bike. Or maybe that’s too strongly put. I don’t actually HATE it. But it squeeks. And it has a back pedal break. And my bell is broken. I can do something about the squeeking and the bell, but that damn break… . I love … the gym. At €165 per year (for university employees, it’s around 200) including full access to the gym and all spinning/aerobic/workout/… classes, you have no excuse not to go (which probably is the point). I’ve been there for the first time today and it was a blast (though I’m stone dead now – after only 2 classes… how disappointing). The teachers are good, the building and equipment are recent and modern, and while the majority of people are students, you see a good deal “older” people (grey hears included!) so I’m not really feeling out of place. I hate … that they don’t have dancing classes. Don’t get me wrong, I love a serious session of Aerobics, but I am completely hooked on “true” dance classes, where you take a song and work out a choreography over a couple of weeks, so that you really have time to make the dance your own. Most group session are “gympa”-based (defined as “All around workout in a group with focus on strength, cardio, and flexibility”) so the dance element is often missing, but even the Funk or Afro sessions are drop-in (understandably) so … not gonna happen. 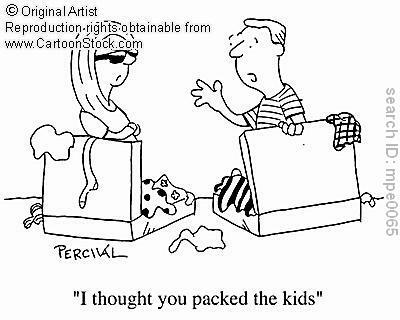 I keep on searching, though! So all in all, the things I like about Sweden are at a slight advantage. Let’s see if they can keep this up ;). And the million dollar question is… what have I forgotten?